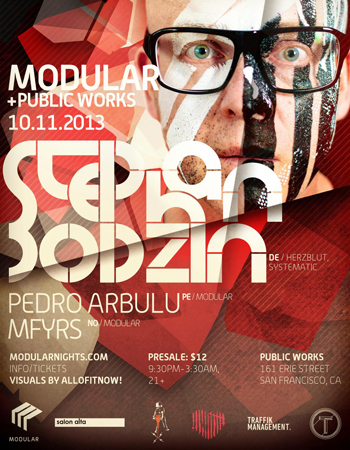 We are so super duper excited to present to you, in partnership with Public Works San Francisco, the first ever San Francisco appearance of Stephan Bodzin, legendary techno artist and DJ extraordinaire, and founder of Herzblut records. Tickets: $12 online, $15-$20 at the door. For all of you who know him, well, you know this will be good and should not be missed. For the rest of you, this will be a truly amazing and inspirational set from a great artist and one of the biggest DJs in the world of techno. “Authenticity is everything – without it everything would appear tobe nothing more than a hollow shell”, says someone who has found himself at the centre of the international techno scene since 2006. The passionate musician from Bremen has become a heavy influence for an awful lot of producers worldwide. As the son of an experimental musician his career in the music industry was set from an early age. And it was only a matter of time before Stephan would fall in love with electronic music. Composing music for several prestigious European theaters was the first successful platform for his music. At the same time he discovered his passion for club sounds and increased his efforts in this area. His mind-blowing talent was soon discovered and producers such as Oliver Huntemann, Thomas Schumacher and Marc Romboy queued up to work with Stephan. Due to the quality of his impressive music he has reached the top of the international techno scene. Most recently he has remixed songs for well-known bands such as Depeche Mode, Booka Shade and The Knife. His releases can be found on labels such as Get Physical, Datapunk, Gigolo, Systematic and Giant Wheel. “Throughout my releases and all my collaborations I managed to let my ideas flow freely and to develop my own style” Stephan explains. “I understood that my personal definition of good and bad music is very dynamic and that’s why intuition is so important in this business”. He describes himself as a “melody man” – “after all it’s the melodies that endure”. The responses to his productions seem to confirm this: his sounds are greatly loved in clubs worldwide. DJ Hell himself has dubbed Stephan’s tunes as the ground breaking “Bremen sound”. It was a logical move to create his own label called “Herzblut” in 2006. As part of the label- conglomerate Plantage 13 he has found the ideal creative framework for his works. His solos productions have done nothing but raise his worldwide profile even more and he now has the freedom of an individual artist with a worldwide audience. “This was a massive step forward”, he explains, “I produce music to share it, and I can experience this great feeling in each of my gigs”. Stephan’s music is as polarizing as he is, both as DJ and live artist. But there’s one statement that holds true for all of his productions: they are certainly of the highest ‘authenticity’. Performing alongside some of the world’s top electronic music artists, Moby, Max Cooper, Super Flu, Tube & Berger and Martin Buttich, Always on the deep melodic tip, he continues to connect to listeners with his heavily influenced sounds of House & Techno. He draws his inspiration from the growing number of electronic music listeners around the world. All Of It Now (AOIN, http://allofitnow.com/) is San Francisco’s premiere club VJ crew headed by Howard Wong and Danny Firpo. On any given weekend in San Francisco for the last 3 years you’ll find the duo lighting up Public Works the top club visual hotspots in the city. The AOIN label is known for pushing the boundaries of live VJing with a unique blend of themes exploring sexuality, perspective, and synesthesia in an immersive widescreen presentation. The audience is enveloped in a constantly changing environment that is both classic and tasteful via the duo’s feathery touch. Howard has been Public Works’ visuals director and VJ resident since its inception. In the early Spring 2013, both Howard and Danny were signed on to light up Austin’s SXSW top music event headliners. The same week Crosstown Rebels signed on the duo as their official tour VJs for Insomniac Events’ Wonderland and EDC shows (Los Angeles, Las Vegas, Orlando). Just as the summer season started to warm up, Howard made the jump to clubland Ibiza to VJ the EDM world-acclaimed summer weeklies Cream at Amnesia and Ants at Ushuaia while Danny serviced state-side bookings. The duo also maintain a VJ residency at California Academy of Science’s Nightlife weekly in San Francisco’s Golden Gate Park since 2010.